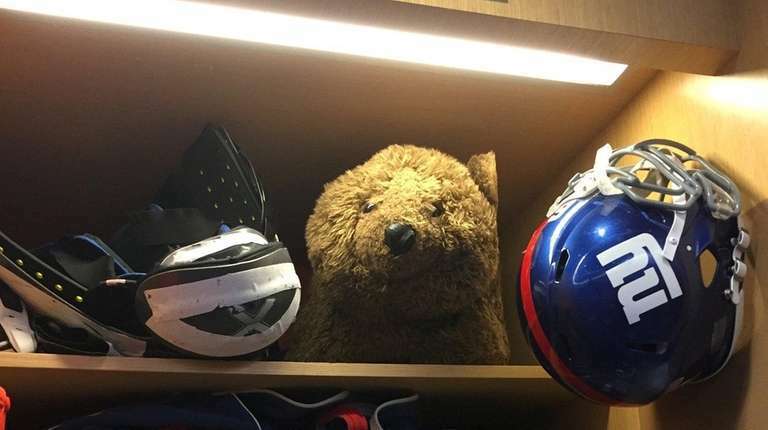 The stuffed bear sits in the top corner of Justin Pugh’s locker and hasn’t moved since the fourth-year guard took ownership of it in 2014. A symbol of the Giants’ Super Bowl runs in 2007 and 2011, the bear accompanied the team for each of its playoff games in those years but has not traveled since. Pugh hopes the day will come next month when the bear comes out of its playoff hibernation. Most players have no idea the bear is even in Pugh’s locker, let alone the symbolism it carries. “I haven’t seen it,” safety Landon Collins said Thursday. The bear is actually an ottoman that Carmen Pizzano, who works in the Giants’ video department, brought in one day during the 2007 season after his wife told him to throw it out. “I’m a big fan of bears,” said Pizzano, who has a large tattoo of a bear on the upper part of his right arm. Seubert eventually transferred ownership to right tackle Kareem McKenzie, who then made one of the Giants’ younger offensive linemen bring the bear to each of the Giants’ four playoff games that year, including the trip to Phoenix for what would be the Giants’ astonishing 17-14 win over the previously unbeaten Patriots in Super Bowl XLII. In 2011, McKenzie had then-rookie tackle James Brewer take the bear for the Giants’ playoff run, which ended with another win over the Patriots, this time in Indianapolis in Super Bowl XLVI. Shortly after Brewer was released in 2015, Pizzano asked Pugh to come into his office. Now he wants to give it to someone else, which would mean the bear is back in business if the Giants indeed qualify for the playoffs. He has someone in mind, too. “Brett Jones looks like he’s ready to carry the bear,” Pugh quipped. The degree of difficulty in getting to the playoffs will go up exponentially for the Giants (8-3) during the next five games, as they will face four teams that would be in the playoffs if the season ended today. The fifth is against the Eagles in Philadelphia. Up next: the 6-5 Steelers in Pittsburgh. 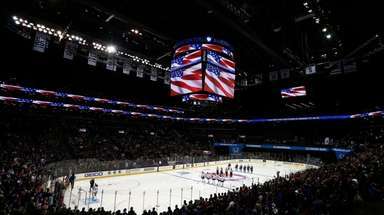 After that, it’s Dallas and Detroit at home before they finish the season at Philadelphia and at Washington. The Giants have won six straight games, but only one of the wins came against a team that currently has a winning record (Baltimore). They aren’t apologizing for winning, though. Pugh, who is recovering from a sprained MCL and expects to return in time for next week’s game against the Cowboys, is hungry for a playoff run and hopeful that the symbol of the Giants’ last two championship seasons can play a part.